This project has found strong local opposition in 2017, against the wishes by Votorantim to explore for several minerals including zinc, copper, lead. As explained in (1), there was copper mining in this region some twenty years ago. Recently the Votorantim Metais Holding (currently Nexa Resources) filed an EIA - RIMA (Environmental Impact Study and Report) in Fepam - RS and held two public hearings to present the project to the population. According to the EIA of the venture (2016) the company has been conducting research on the site since 2008 and would have confirmed the economic viability of the extraction of metals. According to the website, this project includes the intention of exploring zinc, copper, lead, as well as silver and gold as by-products. 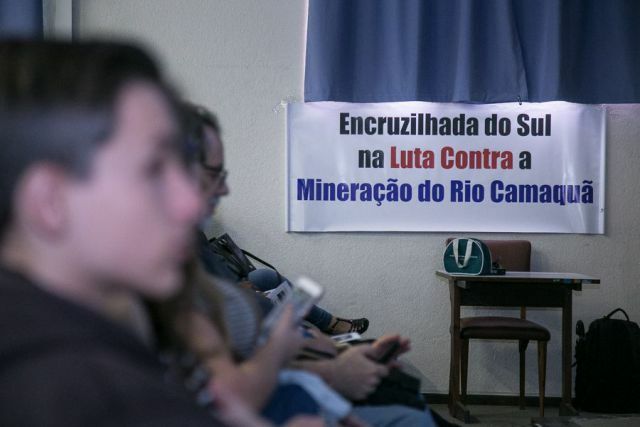 After the protest of community groups about the risk of contamination of the region by lead and with the intervention of the Federal Public Ministry (MPF), new audiences were promoted by the Foundation in other municipalities. 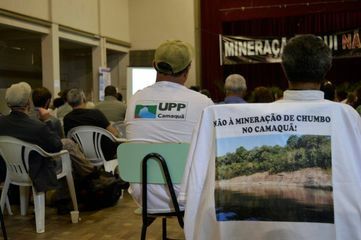 Public hearings were held in Santana da Boa Vista, Bagé and Pinheiro Machado, where the mining company also presented details and provided more information about the EIA-Rima. Soon after, the company's plans generated controversy in at least eight municipalities of the 28 municipalities that compose the Camaquã River Basin, which is the main watercourse in the region. Site Caçapava do Sul; Santana da Boa Vista, Bagé, Rio Grande e mais 26 municípios. Project Details In a more recent period, in the middle of 2016, Votorantim Metais Holding filed an EIA - RIMA (Study and Environmental Impact Report) at Fepam - RS and held two public hearings to present the project to the population. According to the EIA of the venture (2016) the company has been conducting research on the site since 2008 and would have confirmed the economic viability of the extraction of metals. According to the website, this project includes the intention to explore zinc, copper, lead, as well as silver as a by-product, in Passo do Cação, a locality about five kilometers from Minas do Camaquã. The proposal is to export concentrates of the minerals through the port of Rio Grande to international markets such as Europe and China, or to take advantage of some of them in Votorantim Metals in Minas Gerais (zinc case). The public hearings, which are conditioning activities for the implementation of the project, took place in Vila de Minas do Camaquã and in Caçapava do Sul in July. 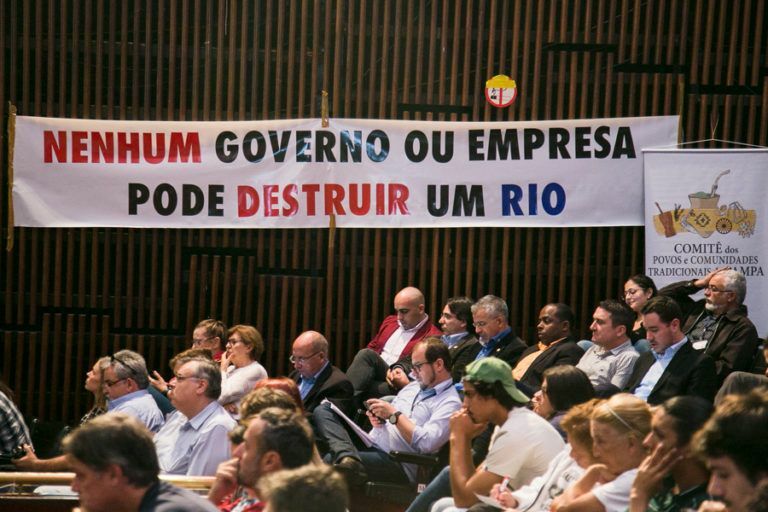 The municipalities of Santana da Boa Vista, Bagé and Pinheiro Machado were excluded from the consultation by Fepam, although the three municipalities limit the location of the project and could be impacted by the project. 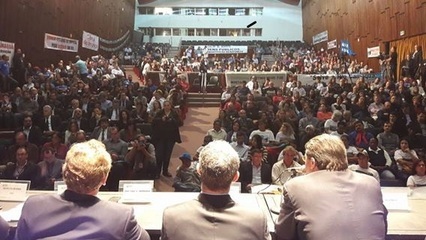 After the protest of community groups in the municipalities and with the intervention of the Federal Public Ministry (MPF), new audiences were promoted by the Foundation. Public hearings were held in Santana da Boa Vista, Bagé and Pinheiro Machado, where the miner also presented details and provided more information about the EIA-Rima. 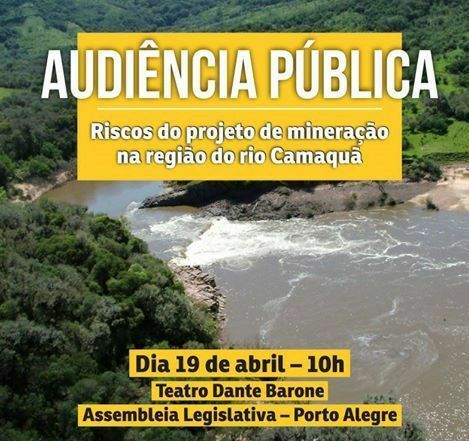 Soon after, the company's plans generated controversy in at least eight municipalities of the 28 municipalities that compose the Camaquã River Basin, which is the main watercourse in the region. The mining company expects an initial investment of R $ 371 million and announces that it will generate 450 direct jobs with the installation of the project, with potential for generating indirect jobs. The project is in the initial phase of the analysis of EIA-RIMA by Fepam, with the expectation of starting operations in the first quarter of 2020. The extraction of open pit mining projects is expected to produce 16 thousand tons of concentrated zinc per year, 5 thousand copper and 36 thousand lead for 20 years. The company says it will not use a tailings dam. On the other hand, organized groups and civil society actors (associations, city halls, self-organized groups and university professors), which we will describe in more detail below, are contrary to the establishment of the enterprise in the region. In addition to the possible contamination of the Camaquã River, the soil, the flora and fauna of the region, especially the lead concentrate, these organizations consider that if there was a greater investment in sheep production, since the region has more than 650 thousand sheep heads, to raise more than R $ 120 million. They also denounce that the great generation of jobs promised with the installation of these enterprises will occur outside the region, because the ores will be exported in the crude form. That is, the justification of the enterprise to settle in the region would be neither economic nor social or environmental, but it is only directed to the interests of the company. Through the Port of Rio Grande it will drain the concentrate of metallic ores, including heavy metal Lead with high capacity of contamination (especially in children), and the community was not consulted or at least informed before the Public Hearing promoted in June of 2017, on the possibility of installation of this undertaking offer risks of contamination to the population and the environment by the sprinkling of ore particles in the air and water. 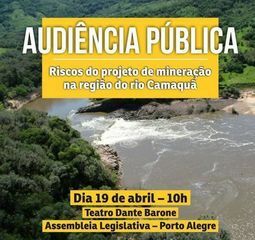 It should be noted that several municipalities that make up the Camaquã river basin were also not consulted or informed about the socio-environmental risks that this venture offers, either because of the possibility of contaminating the waters of the Camaquã River, or by spraying particles along the truck path. 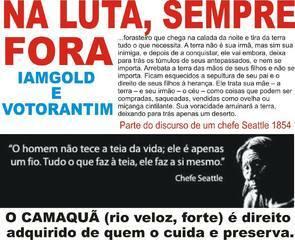 will transport the concentrates to the Port of Rio Grande. 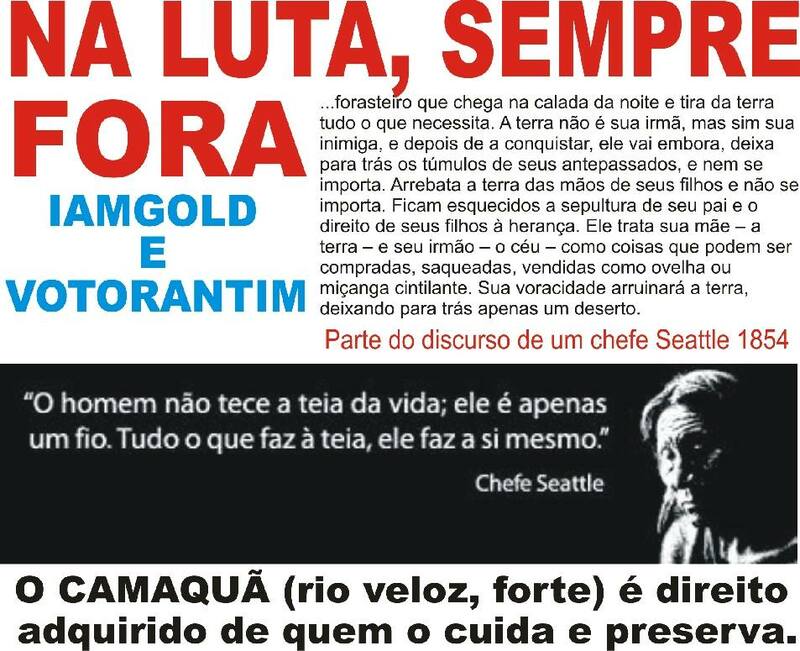 Environmental justice organisations and other supporters Associação para o Desenvolvimento Sustentável do Alto Camaquã (ADAC). ONG Amigos da Terra Brasil . União Pela Preservação do Camaquã (UPP). Development of Alternatives Sustainable livestock and beef cattle production and rural tourism. Why? Explain briefly. It is too early to say but it seems that the company cannot gain local consensus. Rio Camaquã. Sim a preservação! Não a mineração! (2) Conheça as histórias de 5 comunidades que derrotaram projetos de megamineração. Outubro 15, 2017. 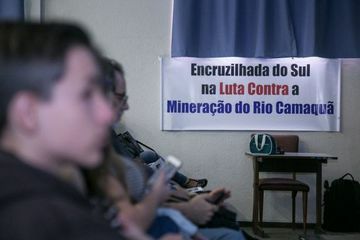 Professora da Faculdade de Administração da Universidade Federal do Rio Grande do Sul (UFRGS) e coordenadora do grupo de pesquisa Organização e Práxis Libertadora, Maria Ceci Misoczky apresentou cinco exemplos de vitórias de comunidades contra a mineração (na America Latina).